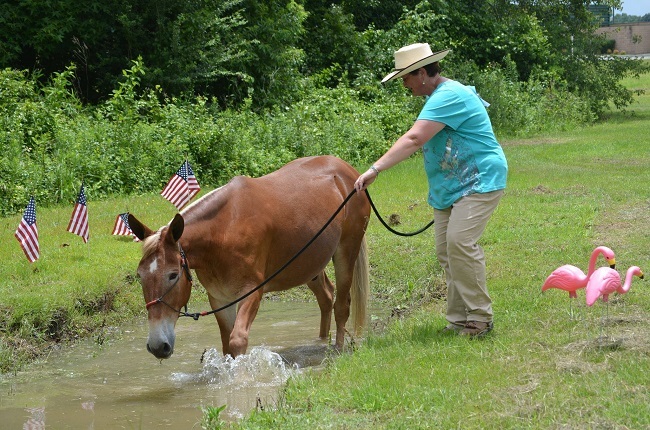 Seven has actually featured on the blog before – he was included in the round-up of different mule types last month. I thought at the time how beautiful he was (have I mentioned that I have a soft spot for draughts? ), so I’m really pleased to have him back for his own post. After talking to his owner, Shannon, it sounds like he shares many similarities with Marty; she gave me a lot of advice, which I’m hugely thankful for. She also supplied me with some of the most fantastic photos! Shannon has a great blog which you can read here. Lucky Number Seven – 20 year old, Belgian Draft cross, John Mule, 15.1 hands, Sorrel with white mane and tail, Star. 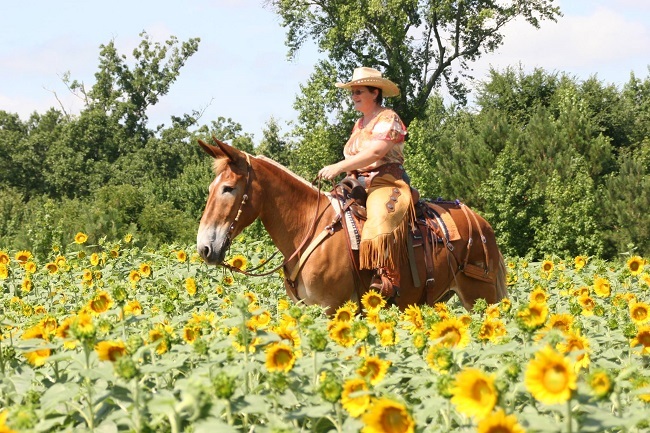 I am Shannon Hoffman, live near Raleigh, North Carolina, USA on the St. Clair Red Mule Farm. I work at a full time office job but ride, train and help people with their mule and donkeys the rest of the time. I have been an Open Horse Show Judge for the last 15+ years and so enjoy working with 4-H kids and anyone who wants to learn. I still, of course, take lessons and I am so blessed to have found a wonderful mentor who is a great teacher and has such great horsemanship skills she doesn’t blink at working with a mustang, mule or mammoth donkey! A good friend of mine who buys and sells mules on the side had him for sale. 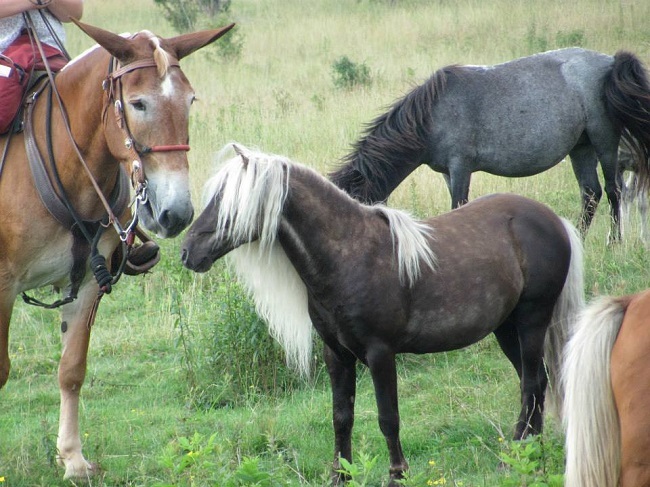 I had already decided that my next mule would be a Belgian Draft Horse Cross. I actually suggested the name Seven to my friend because Seven has a freeze brand on his hip with a 7 in it. I met Seven at a fun show that my friend brought him to. I used him for a lead line class and rode him just for a few minutes. I did not have my own farm at the time and so I could not buy him without first selling my other mule. I watched Seven being loaded on the trailer that day, SOLD to another family. I was really trying not to be crushed. But a week later they decided he was not the mule for them and called to return him. I told my friend that I would go and pick him up and wanted to try him out. So I scrambled to find a place to put him! He was green and scared of his own shadow half the time but there was something about him I liked. I was going through some fear issues for the first time in my adult riding career, myself, and we just seemed to work things out. I named him Lucky Number Seven because he has the number 7 branded on him, he was 7 years old and I paid $700 for him (my friend gave me a steal of a deal). Now my life has so many occurrences of the number 7 in it, ones I did not even realize were there. I started out just trail riding him with my Mule Club and going on weekend camping trips. I used to show hunters and then all-around in Quarter Horse circuit and so I just kept riding and training him, to see what I could teach him. I believe in having a well-trained and well-rounded equine that I can take anywhere and try anything with. 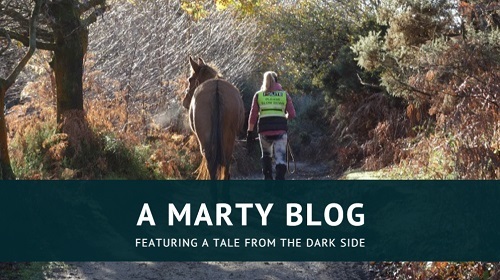 I started using trail obstacles, tarps, water boxes, mattresses, pool noodles and such to gain his confidence in himself but he also had to trust and look to me – rather than spooking, doing a 180’ spin and bolting. I kept working with him because he always showed TRY for me, even when he was afraid and he always got just a little better. I showed him English and Western in open shows and usually did pretty well with him. We also learned to work cattle and he really enjoys that. We started doing Cowboy Races and Obstacle Challenges when they became popular and for once in my life I was ahead of the learning curve on something, since we had been doing so many obstacles. He gained confidence in himself and even became so brave he would charge at the obstacles like he enjoyed it! Over a few years he won three belt buckles, two from high point end of the year competitions and one from a tough one-day class. Seven and I would get called to go over and be “company” for young race-horses out on the training track who were ready to be exposed to being in a crowd of other horses. We of course could not keep up when they ran full out but we acted as blocks and moved around the horses as they warmed up to give them experience. On one of these trips, my trainer friend asked me to help him back a horse in the round pen. After things went well, he told me about all the problems he had been having with this particular horse and his fears during training. It seemed that the race-horse really liked Seven. Seven seemed to understand that when he got scared and moved closer to him that he was not being aggressive, just unsure. So Seven would let him get close, where other racetrack ponies would drive him off, having a very negative effect. Seven and I went over 3-4 nights a week for 3 months, to help get this race-horse trained and ready for the track! We both had never been in such good shape! The race-horse went on to win several races and have a good career. We have also given a go at Dressage and even Western Dressage. Seven competed in a fundraiser with a friend of mine riding him, where they completed a dressage test and then an obstacle course! They did great together and even beat the 6 other horses (with their regular riders) to win! 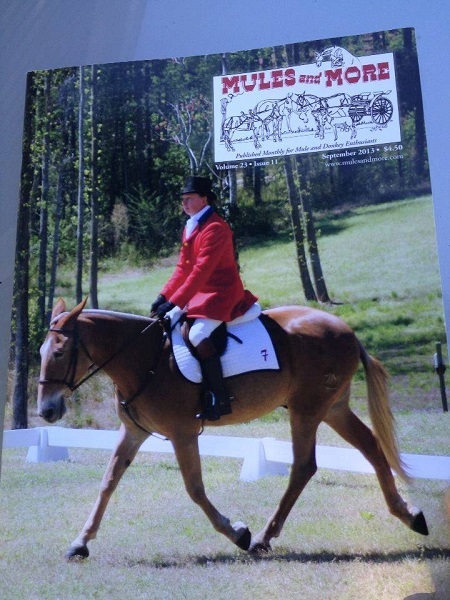 He was on a cover of Mules and More Magazine with an article about the win! The last few years I have backed off competition and we have been mainly just trail riding both on trips and around the house. 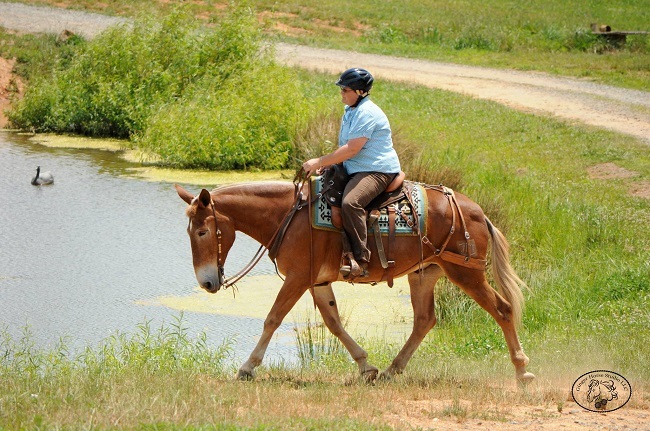 He has a new rider, a friend of mine, and he so enjoys trail riding with her. He gets pulled out to do a lesson or two and to help me pony and work with other mules and donkeys. He remains sound and strong and ready to go on our next adventure. I hope to have him as my Best Friend for many years to come! I don’t really have a specific example but our relationship is based on leadership and a mutual trust of each other that had to be built step by step. When he gets him self in trouble (leg caught in a cinder block, hay bag strap, etc. ), he waits, knowing I will help him, when he is afraid of something he stays with me, physically and mentally for me to show him it’s ok. When he is unsure of someone he knows I will stand between him and them, if needed, to make him feel comfortable. I know he is MY Mule because he is always watching me, trying to see where I am. I had to earn that level of partnership from Seven, as with most mules. I know he will listen and try for me, no matter what, well except maybe not for a scary hiker! He will carry me over the mountain and the next one. Seven understands me more than I can understand myself sometimes. I have learned so much from him and he makes me be a better human. He is so sensitive that he makes me more aware of my own environment, if I watch and listen to him. Seven is very smart and shows me once in a while just how smart! I taught him to come to a mounting block, rock or log to help me mount up. He has always been very helpful in letting me get him in just the right place to help me. One day he was just a little bit farther away than I felt was safe and I just asked with my voice, “Come Closer”, I was stunned when he did just that. Mules are so smart and connected. I use this statement from dog trainer Cesar Milan, “Calm, Confident, Leadership” when speaking of how to handle mules and donkeys. If you stay Calm and Confident when asking your mule to do something, and they become upset or fearful, it will help them stay calm and be confident. Leadership is needed to direct and teach that this is needed from the partnership. If you are not a leader then the mule will start making his own decisions about what he would like to do and what is safe for him. You might not like those decisions! Mules understand Justice so the punishment better fit the crime and your animals personality (don’t ever lose your temper). Mules need for you to give them clear expectations of them and then honestly reward them for working for you. A very important part of the punishment when needed is to not harp on what they have done wrong after it has been corrected. Move on to better things once you have made yourself clear. For Seven, a slight jerk on the lead rope or a small yield of hindquarters and a sharp “No” from me is more than he even needs. The more good horsemanship you use with them the better. I have learned more horsemanship since I started working with mules, than any other time in my life. I think it is because you need it to be effective. Training tricks and force will only get you an unhappy and resentful, if not scared of you, Mule Partner. Obedience: if you don’t have a cooperative partner when at home and things are going well, you will have big problems when things get crazy! If they can’t stand tied for grooming, Vet work and Farrier at home, how will they handle being tied at the trail-head while you are busy for a minute. I would never get on a mule that was disrespectful on the ground, because the ground manners are a reflection of what you will get from the saddle. There is always more to learn if you are open to thinking things through and listening to your mule! If you would like your mule to be featured here, then please contact me either via this blog, message me on my Mulography Facebook page, or email me at: herecirm (at) gmail.com. 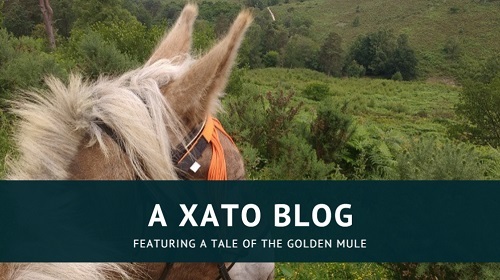 I would particularly like to hear from UK mule owners (purely because Mulography is about owning a mule in the UK), but am more than happy to take worldwide submissions!